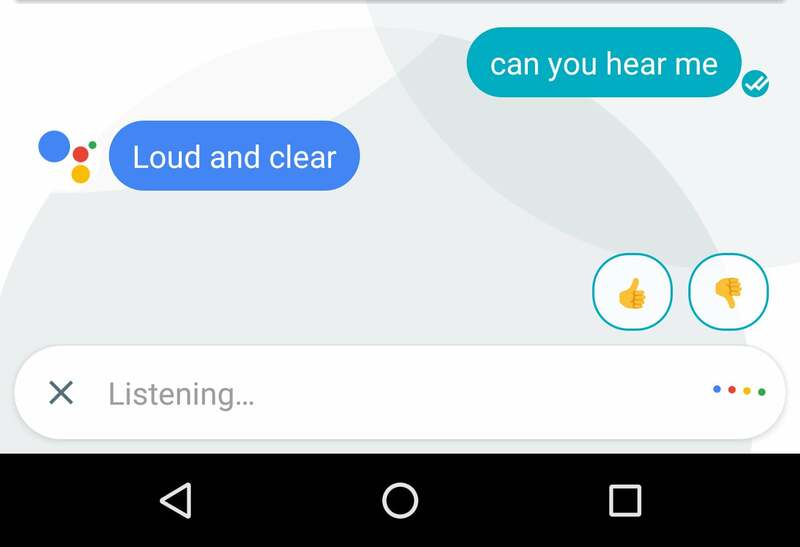 Allo is designed to show off Google Assistant. Here's some of the coolest stuff you can do with it. I'm your Google Assistant, how may I help you? Google announced its Allo chat app back at Google I/O in the spring. It promised the app would be available later in the summer, and it just barely made it. Now that Allo is available, it's plain to see this app exists almost entirely as an excuse to show off Google's Assistant chatbot. 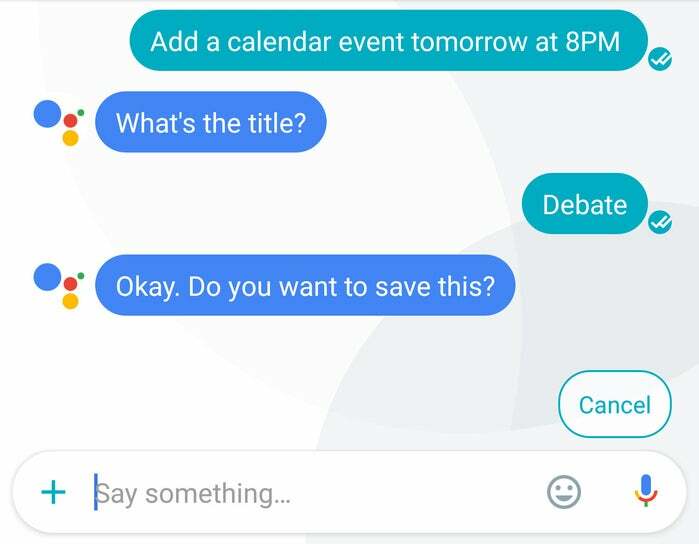 You can invite Google's AI into your conversations, or talk to it directly, on-on-one. What does that get you, though? 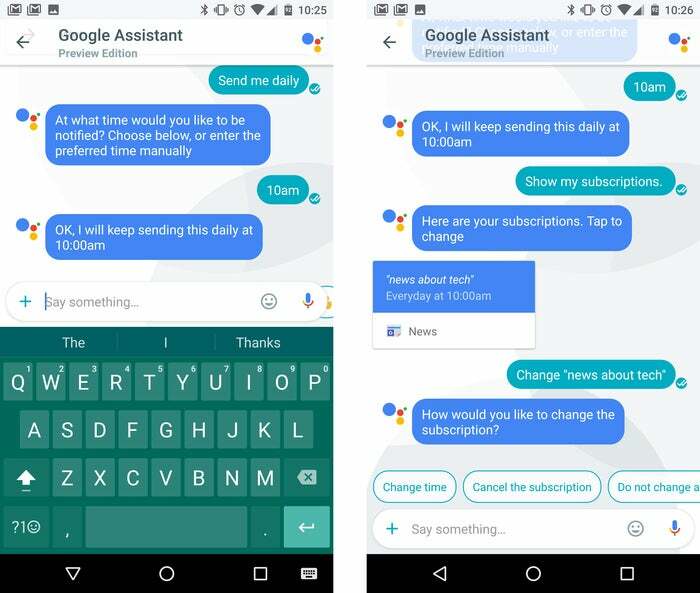 Here are 10 cool things you can do with the Google Assistant in Allo that you should know about. There are about a thousand ways to find out the current weather where you live. But how about the weather next week? Or next week in a completely different part of the world? What if you have several questions about the weather but you don’t want to do a full search for each one? You can just ask Assistant about that and it’ll provide the relevant data faster because it remembers the context. For example, you can ask, “Will it rain tomorrow?” After getting a reply, you can follow up with, “How about over the weekend?” If you’re planning a trip, you can just ask Assistant about the weather in any location, either now or in the future. If you’re making plans with friends over Allo (after you’ve convinced them to start using it), Assistant can help you add events to your calendar without leaving the app. Just tell Assistant to add an item to your calendar, and it’ll ask you for the time, title, and if you want to save it. If you say yes, it’s saved. If you say no, Assistant asks if you’d like to make changes or just cancel. 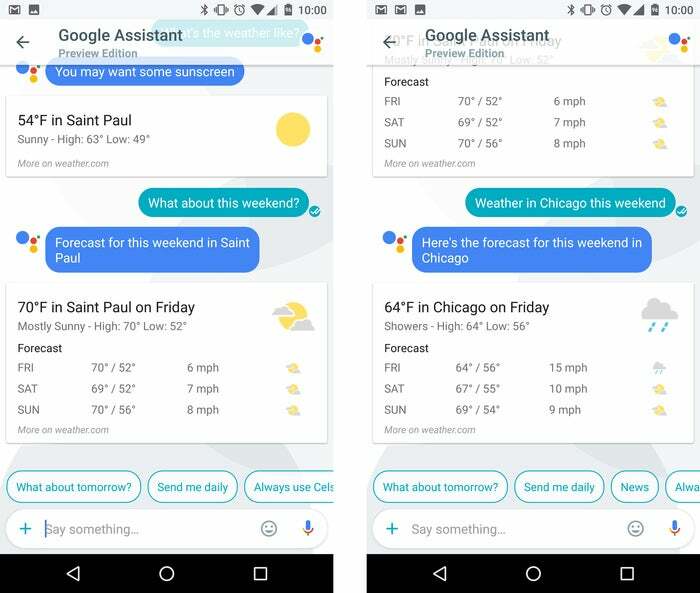 Allo includes the ability to send voice messages to your contacts, but the Google Assistant can hear you too. Instead of typing your questions and commands, you can send it an audio message. If you’re having a chat only with Assistant, tap the microphone button and start talking. If you’re talking to someone else, make sure you tag Google, then long-press the microphone to record and let go when you’re done. Either way you do it, Google will get your voice message and respond to if as if you’d sent text. As you chat with the Google bot, you will inevitably surface useful information. So, what happens when you need some of that information again? You could ask the question all over again, or you can just search. 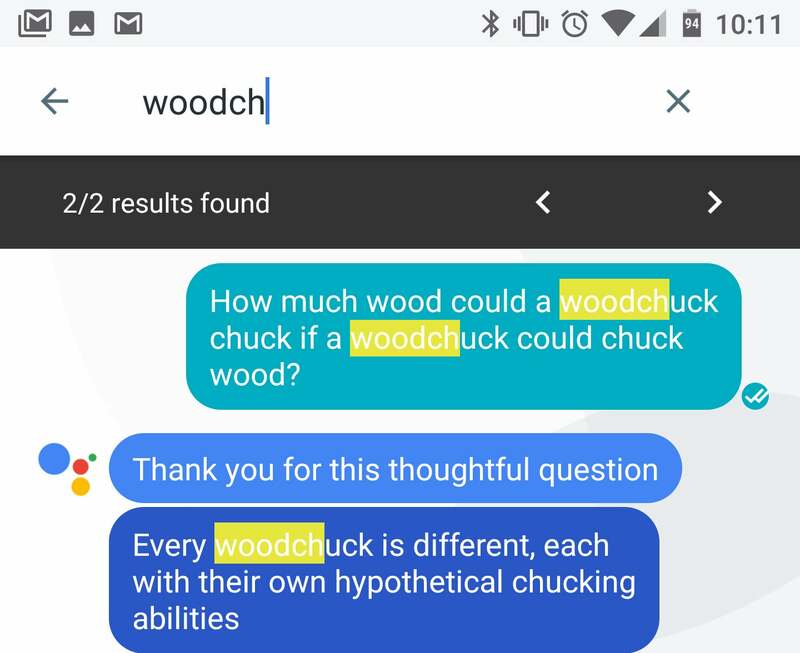 The Google Assistant chat (and all other non-Incognito chats) keep a full searchable history. In the Assistant chat, tap the icon in the upper right corner, which hides an overflow menu button. Tap “Search” and type the first few letters of what you want. Allo will highlight matching strings in the chat, letting you page through them. 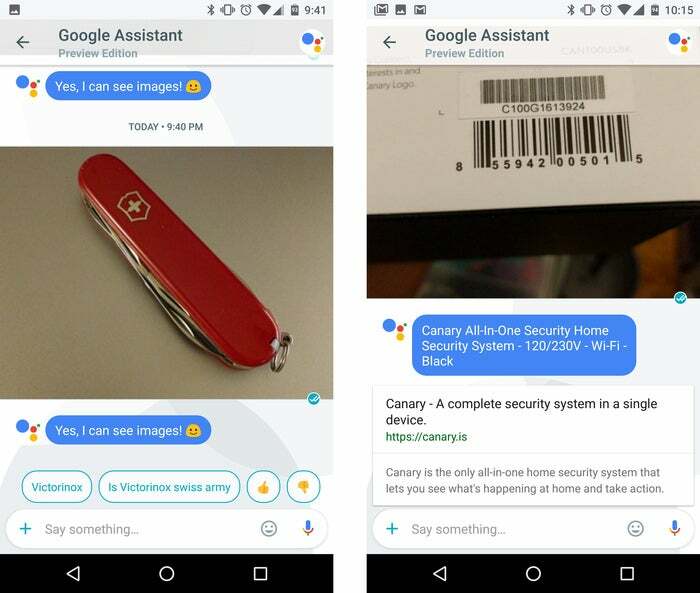 Assistant can read what you type and hear your voice, but it can also see images you send it. It’s able to read barcodes, recognize faces, and even identify landmarks in photos you send. You can finally uninstall that ancient barcode scanner app you’ve been using, and just send all those to Assistant. It’s also almost creepily good at recognizing products and logos. It’s a great way to get more information about things you come across in real life. If you back up your photos to Google Photos (which you should, it’s free), Assistant can page through them at your request. 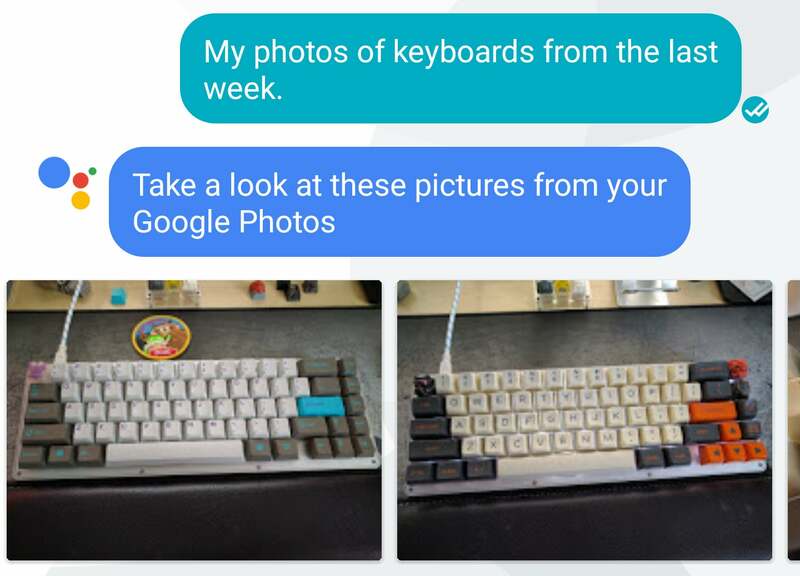 For example, you can ask Assistant to show you photos you’ve taken of certain things like dogs or sunsets. It’s even able to look up photos by the metadata, so you can ask it for photos you took in a specific place or on a particular day. Importantly, you have to specify “my” photos in the request to get it to look in Google Photos. Otherwise, it just looks on the web, which can be useful too. Assistant can be used to find music, and you don’t even have to leave Allo to listen to it. Just search for an artist and song title, and more than likely Assistant will be able to find a YouTube video for it. Tap the video thumbnail and a video player will pop up and play. 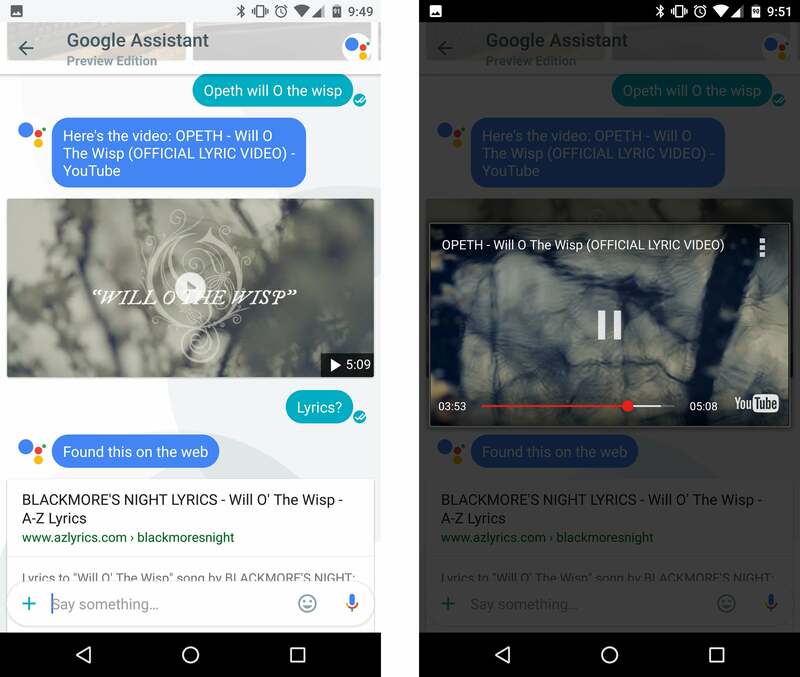 You won’t have to go to the YouTube app, but you can use the prefix “Play” when looking for music to have Assistant shoot you over to your default music player app. 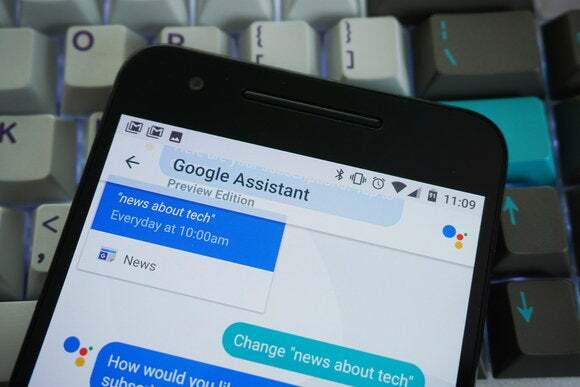 You can have Assistant pull up whatever news you want on-demand, but you can also have useful information sent to you automatically on a daily basis. Just tell Assistant to “Send me daily” after completing a query. Assistant will ask for a time, and your subscription is all set up. You can subscribe to news, weather, and even currency exchange rates. You can see all your subscriptions in Assistant just by asking. If you want to alter one of them, it’s easy—tell Assistant you want to change or cancel one. It’ll ask for the new setting, and you’re done. 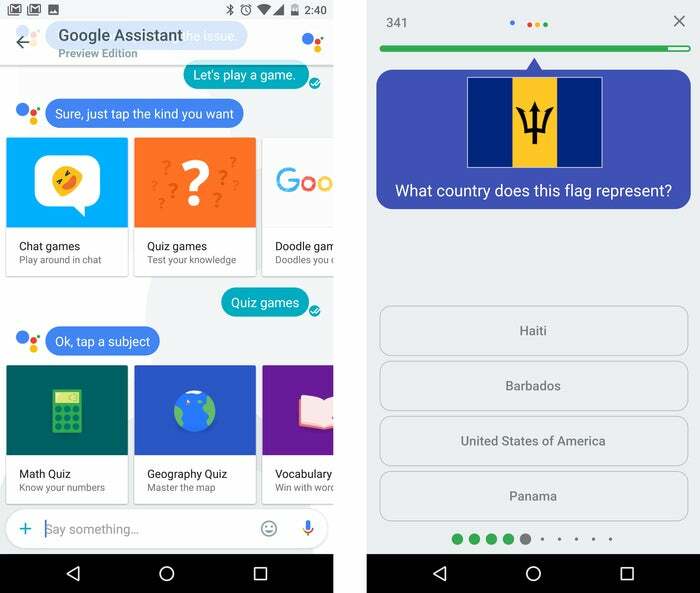 Now that you’ve done useful things with the Google Assistant, you can just kill some time with a game. Just tell the Assistant you’d like to play a game. 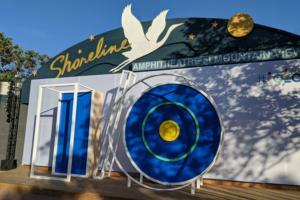 It offers a few options for classic games like solitaire, games from Google Doodles, quizzes, and chat-based games. The quiz games are the most structured with multiple topics, difficulty levels, and a whole separate interface inside Allo. The chat games are rather weird—they’re all based on emoji. You can guess the names of movies spelled out in emoji or reply to riddles in emoji form. Okay, enough serious stuff. How about some silly fun? Who doesn't love a good joke? Even bad jokes can be fun when it's a robot telling them. Such is the case with Assistant, which specializes in "dad jokes." 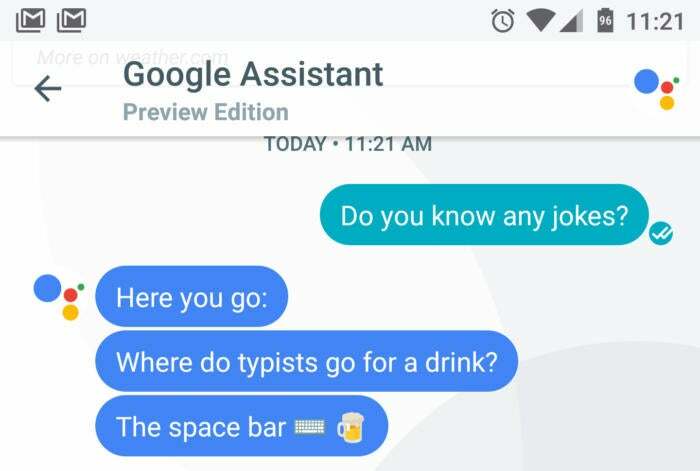 Just ask Assistant to tell you a joke, and it'll let loose with a real knee-slapper. You can also ask for interesting facts or random fun (usually an amusing YouTube video). If you like any of these, you can ask for another or subscribe.